To register, please call (609) 465-7181. Each year, the Annual Meeting hosts nearly 300 prominent members of the Cape May County business community. This year our guests will enjoy a fabulous networking and social hour followed by an elegant dinner featuring the installation of Officers and Directors. The evening also includes the presentation of special awards including Member of the Year, Volunteer of the Year and our Conservation Awards. The Chamber’s Annual Meeting is a prestigious way to highlight and promote your business. 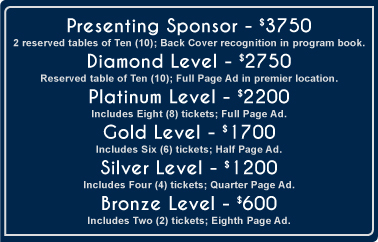 Sponsoring businesses of the Annual Meeting and Installation Banquet will receive special recognition in all pre-event publicity and promotions as well as the corresponding number of tickets. All Sponsors confirmed by September 1, 2017 will also have their logo included on the mailed event invitation. Cocktail Hour from 5:15 p.m.
Dinner Program begins at 6:30 p.m. Call Brigitta Scott at (609) 465-7181 x104.